Japanese beverage maker Kirin is partnering with Casio to release a custom G-Shock DW-5600 to promote the Mets Cola soda. 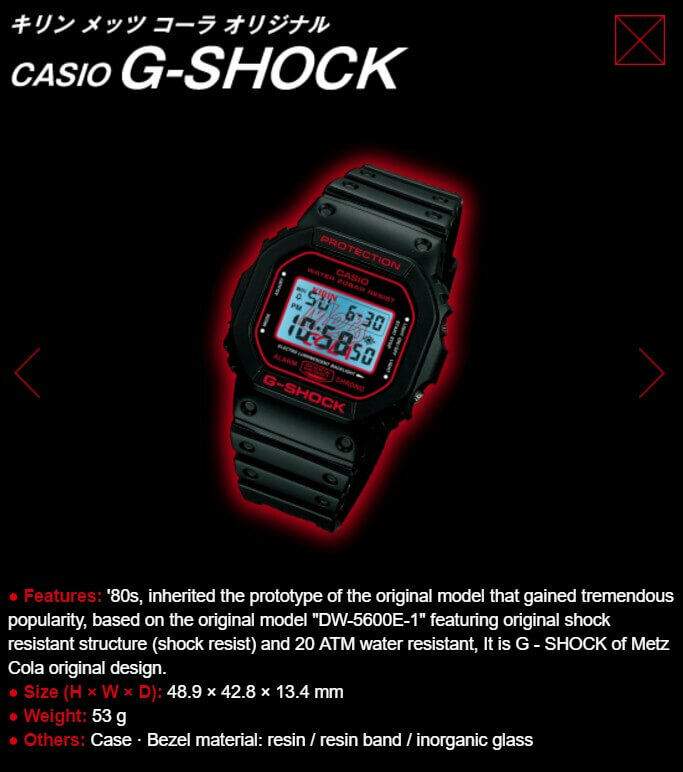 1,000 of these black DW-5600 watches with red accents and a branded EL backlight will be given away by lottery. A purchase of Mets Cola is required to enter as well as a My Kirin online membership. The promotion also includes the giveaway of 100 MA-1 jackets and 1,400 sets of Tamiya model cars. The contest runs until May 11, 2017. Mets Cola was launched in 2012 and billed as a “health-food soda” due its lack of sweeteners and the inclusion of an indigestible form of dextrin that restricts the body’s ability to absorb fat. For more information visit metscolacp.kirin.co.jp.